A person was swept under a van and dragged nearly 20 miles on New York City highways before a pedestrian told the driver what he was carrying in tow. A man crossing a busy New York street Wednesday was plowed over by an SUV, trapped underneath a van and dragged nearly 20 miles in a punishing, 50-minute trek that was so violent it sheared off the victim's heels and clothing. Police said the gruesome episode was accidental, and they have no plans to charge the drivers. 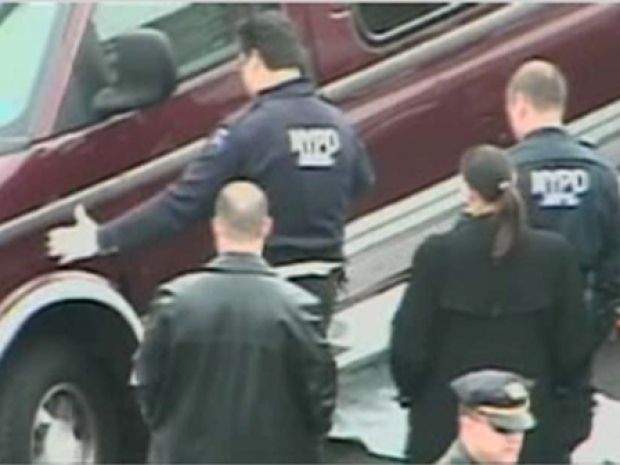 But that did not diminish the shock of seeing a dead man hooked under a van that had just traversed some of the busiest roads in New York City. Police said the driver, Manuel Lituma Sanchez, had no idea he hit the victim until the end of his trip, when a bystander told him something was dragging under his van. Investigators were working to identify the body, found largely intact but horribly battered. The man's heels were shorn off. His clothes and several layers of skin on his legs and buttocks were worn off. The back of his head was worn through to the scalp. A broken iPhone, business card and Western Union receipt were found in the man's pockets, said NYPD spokesman Paul Browne. He was first hit around 6:15 a.m. in the Corona section of Queens, while apparently crossing against the light, by the driver of a black Ford Expedition, Gustavo Acosta, who immediately called 911. When police arrived, the victim was gone, and there was no damage to the SUV, making it seem Acosta had not hit anything after all. Police are trying to determine the identity of a man who was dragged by a van nearly 20 miles on New York City highways. Meanwhile, Lituma Sanchez, who was about two vehicles behind, said he had noticed cars swerving, but he didn't see the initial accident and assumed the drivers were simply avoiding a pothole. But he somehow drove over the victim, who was facing up, and the man became hooked under his sternum and up through his chest by a steel plate under the van known as the skid plate, used to protect the transmission and undercarriage. It's not clear whether the victim was alive at that point. An autopsy was scheduled for Thursday. Lituma Sanchez stopped shortly after the accident to check his car but noticed nothing and went on his way. The vehicle has a low ridge around the wheels for stepping inside, making it difficult to see under the van. Lituma Sanchez drove on the Grand Central Parkway, the Van Wyck Expressway and the Belt Parkway, winding from Queens to Brooklyn and ending up in Brighton Beach, where he worked as a delivery man, Browne said. On the residential streets at a slower speed, he suspected something was wrong with his engine, and he stopped, opened the hood and checked the oil. But he did not look under the car. He got back in and drove a few more blocks before a pedestrian flagged him to say something was dragging under his 1998 Chevrolet van. Lituma Sanchez got out of his car again, looked underneath, discovered the body, and called 911 from his cell phone. Police jacked up the vehicle and pulled the body from under the van. The battered corpse, found with the shirt and pants shredded, was covered with a white sheet as officers investigated and talked to the shellshocked, exhausted driver in a police car. The victim's bruised and bloody legs could be seen protruding from the sheet in front of the van. The body was later strapped to a gurney and put in an ambulance. An autopsy was planned for Thursday. Both drivers have clean records, police said. Police retraced the van's route and recovered a blue jacket believed to belong to the victim. The victim was described as a Hispanic man in his 20s or 30s, between 5 feet 2 and 5 feet 4 inches tall. Police had initially believed it was a 17-mile journey but did a closer examination of the route realized it was 19.8 miles instead.